The new directorate for the Dartmouth Outing Club for the next four terms was announced on Tuesday night via email. The elected members will replace the current directorate in the spring. The voting period for DOC members closed the previous Sunday, Jan. 26. The DOC is the College’s largest student organization, with over 1,500 members and 13 different sub-clubs. Mallory Byrd ’19 was the sole presidential candidate and was subsequently elected president for the next four terms. As a co-chair of the Dartmouth Mountaineering Club, she instituted new trip leader training requirements and policies that monitor the DMC’s carbon emissions. She also participates in the Ledyard Canoe Club and was a member of Klymbing Cru for the 2016 First-Year Trips. “She brings a fantastic energy, passion for the outdoors, vision for change and demonstrated ability to turn ideas into tangible outcomes,” said Alex Lochoff ’17, the current DOC president. As president, Byrd hopes to institute policies that will help the DOC become more cognizant of its carbon emission and overall environmental impact, she said. She also hopes to expand safety measures for trips and increase the inclusivity of the organization. She plans to make the most of her four terms as president by ensuring that policy ideas materialize instead of stalling during the planning stage. “It’s an incredible honor, and I’m really hoping that I am going to be able to do well for the club and actually push it forward,” she said. Carolyn McShea ’18, Anna Ellis ’19, Laura Hutchinson ’19, Rongfei Lu ’18 and Lauren Mendelsohn ’19 were elected as vice presidents of the DOC. McShea will serve for the spring and fall of 2017 and winter 2018. She began her involvement with the DOC as a freshman by participating in Cabin and Trail. Since her initial involvement, she has become a leader in CnT and has explored other organizations under the DOC umbrella. She also served as the DOC president last summer and co-chair of Women in the Wilderness. Ellis will serve as vice president for spring and summer 2017. Within the DOC, Ellis serves as a leader in CnT and has organized hiking trips to Big Bend National Park in Texas and Hawaii and to the Presidential Range in New Hampshire. She has also participated in activities with Ledyard. As a vice president, she hopes to organize inter-club activities to increase overall student participation in the DOC. Hutchinson will serve during the summer of 2017. She has worked as the chair of Winter Sports Club and Women in the Wilderness for three consecutive terms. She also traveled to southern Arizona and northern Quebec with the DOC. Hutchinson hopes to increase inclusivity and better advertise the DOC’s resources and opportunities as vice president. Lu will serve during the fall of 2017. He previously worked as the treasurer of the DOC during the spring of 2015. Mendelsohn will serve as vice president during the winter of 2018. She has been a leader of the Woodsmen team and CnT. She has also been a member of summer trial crew. Andrew Crutchfield ’18 and Alex Derenchuk ’19 were elected as treasurers. Crutchfield will serve during spring and fall 2017 and winter 2018. Crutchfield began participating in the DOC during his freshman winter. While his primary involvement has been with Ledyard, he has expanded his involvement to other sub-clubs in the DOC. Derenchuk will serve as the treasurer during the summer of 2017. He has been a leader of the Dartmouth Mountaineering Club. He also participates in Winter Sports Club and CnT. He hopes to use his position as treasurer to increase DOC outreach and subsidize trips. This election also marks the end of the current directorate’s tenure. During Lochoff’s tenure, he helped the DOC create policies that increase trip leader preparedness and overall inclusivity. He also led the creation of the fund in honor of Chris Vale ’18, a student and former DOC member who died this past summer while climbing. That fund will supply a group of Dartmouth students with $5,000 to pursue an outdoor trip. This year’s beneficiaries will travel to Alaska in the summer to free ascend mountain walls, Lochoff said. He also spearheaded efforts to increase DOC involvement with other campus organizations. Up until the election, Dru Falco ’18 and Lainie Caswell ’17 served as vice presidents, and John Brady ’19 was the organization’s treasurer. 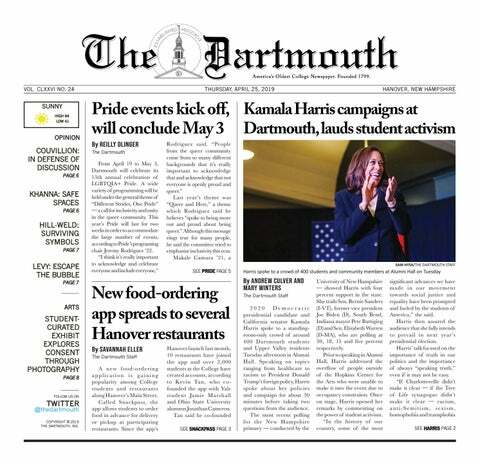 “Being part of DOC leadership has been an important part of my Dartmouth experience because it allows me to give back to the club that gave me a community on campus,” wrote Caswell in an email statement. Lochoff said that, although he is no longer the leader of the club, he hopes it will continue to thrive. A previous version of this article misspelled Mendelsohn's first name. This story has been updated to reflect this correction.